Every parent, teacher, social worker, therapist, and physician should have this succinct and informative book in their back pocket. Framed with both humor and compassion, the book lists the top ten characteristics that help illuminate-not define-children with autism. 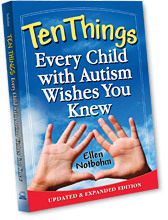 Ellen's personal experiences as a parent, an autism columnist, and a contributor to numerous parenting magazines coalesce to create a guide for all who come in contact with a child on the autism spectrum. Readers typically do not buy just one of this book-they buy one for everyone who interacts with their child! In this revised and expanded edition, new features like updated research, additional sections, and study guides will pave the way for its inclusion in book clubs, college curricula, and more!